As the Windows Installer service becomes the preferred method for installing software on 32-bit Windows, tools for interacting with the service are becoming more powerful. InstallShield Tuner is one of the latest of these. Think of a transform file as a set of pre-selected choices for a Windows Installer package. For example, if you install Office 2000 on your hard drive, you’re presented with a customization panel that lets you choose the specific components you’d like installed. A transform file can capture a set of choices from this panel, allowing the network administrator to specify a standard installation, thus eliminating the worry that users will change things. Prevalidation — Checks to make sure the original Installer package is free of problems before you create a transform. Setup Organization — Allows you to specify a destination and choose the features to install or leave out. You also can select the features where users can exercise choices. Target System Configuration — Allows you to add additional files, registry keys, shortcuts and folders to an installation. 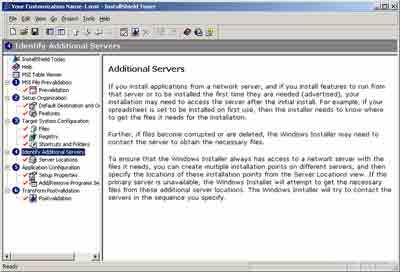 Additional Servers — Lets the network administrator create multiple source servers for a single installation. Application Configuration — Customizes miscellaneous settings — for example, the application’s control panel interface. Postvalidation — Checks to make sure the final product doesn’t break Windows Installer rules. After working through these steps, you end up with a Windows Installer transform (.mst) file. 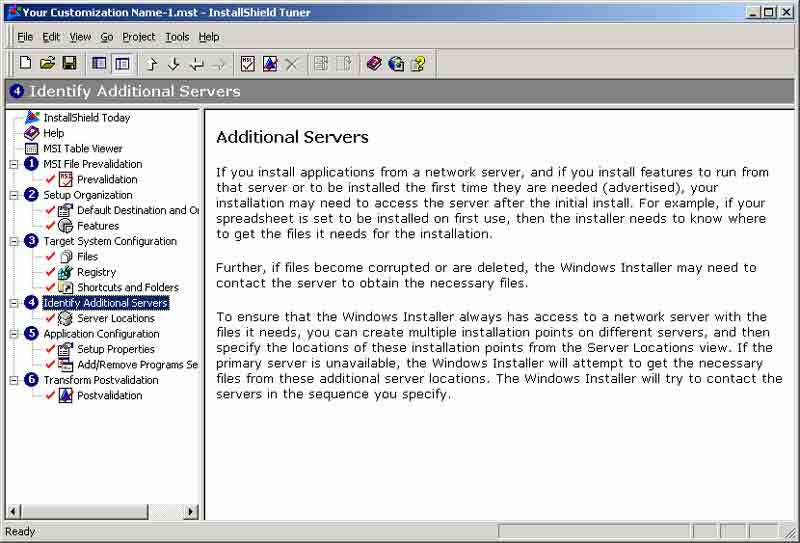 The network administrator then can distribute this transform along with the original Installer package, knowing users will be installing given software in a specified manner. I put Tuner through its paces on several Installer packages and it performed flawlessly. One nice touch is that it will work with any Windows Installer package, not just those created by InstallShield’s other tools, so it can be used for many of your organization’s setup needs. A busy network administrator should find that this tool easily pays for itself in reduced help desk costs.